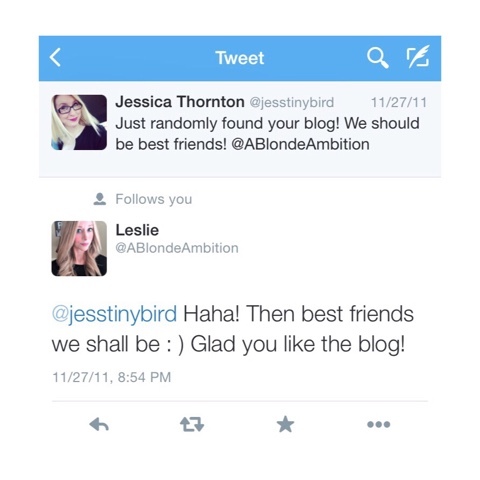 Leslie Sisti, blogger of Blonde Ambition Blog, went home to be with Jesus this week. It's so hard to wrap my mind around. A 30 year old wife and mom of two girls under the age of two is gone. I feel a bit silly for crying since I only knew her online, but the sphere of blogging/social media that we have allows us to connect so closely with people that it feels justified. Leslie was my friend. I traced our relationship on Twitter hoping I would find the beginning, and I did. I often linked up on her Confessional Friday link-up. It feels tragic that she won't post any more witty, bright fashion posts or any more grateful, full-of-love posts about Stephen and their girls. I know in the grand scheme of life, our online posts are pointless to people who don't post as well, but it builds a bond and forms relationships that are true and real and vulnerable. I am thankful to have gotten to see her smiling face on social media and to read her heart on her blog. I'm mostly thankful for the faith she had and the peace that her salvation provides. Please keep Leslie's family and friends in your prayers as they try and get through this hard time. Her love for her family was so apparent, and I'm so glad she shared that with all of us. One of Leslie's friends is collecting letters for Caroline and Ainsley so that when they get bigger and are missing their mama, they can read about the lives she touched and be reminded how much she loved them. Read her post here about how to contribute. As Leslie would say, "Be blessed lovelies." We can say we were and we are - because we knew you. Thank you for sharing Leslie today. She and I went to college together, but honestly, I knew her through blogging too. I started and wrote about today, a letter campaign, for the girls. If you might be interested in sending the girls a piece of love from yourself about their mother, I would love for you to participate! You can see the details on my blog, or shoot me an email!